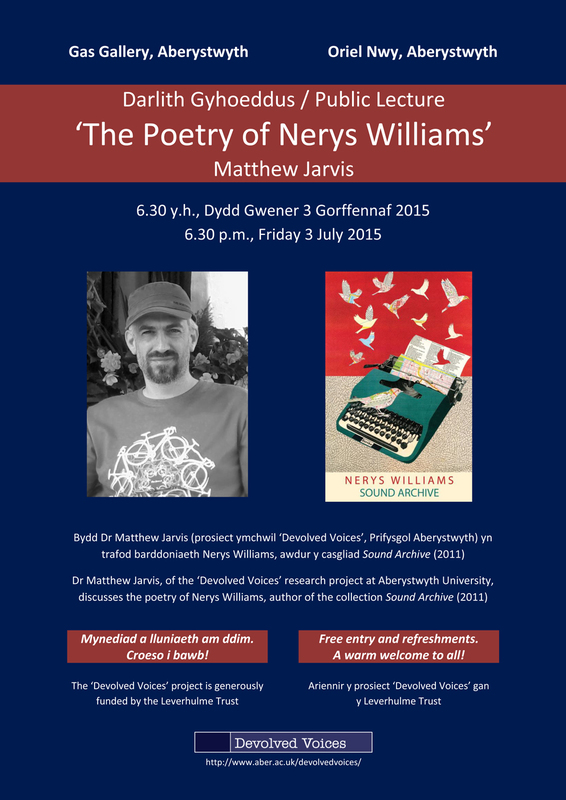 I will be giving my next Devolved Voices public lecture on Friday 3rd July, at 6.30pm, in the Gas Gallery, Aberystwyth. 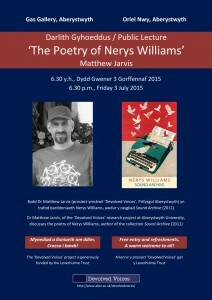 My subject in this session is the poetry of Nerys Williams, whose debut volume Sound Archive was published by Seren in 2011 and was shortlisted for the Forward Prize for Best First Collection in the same year. Recently, I’ve enjoyed reading Nerys Williams’s interview with Alice Entwistle in the book In Her Own Words: Women Talking Poetry and Wales (published by Seren last year). Williams is an intriguing poet whose debut volume, Sound Archive, was well received by reviewers and had pleasing recognition in prize culture – most notably, it was on the shortlist for both the 2011 Michael Murphy Memorial Prize and the 2011 Felix Dennis Prize (the Forward Prize for Best First Collection). But Sound Archive isn’t in any way a straightforward read, as some of the reviews make very clear. Perhaps most notably, Leah Fritz wrote in Poetry Review about how Williams’s poems make music and ‘some kind of sense, perhaps’ – that perhaps being important. Similarly, John Greening, in The Warwick Review, expressed both bafflement and delight in his response to the collection. I think that Williams’s interview in the Entwistle book gives us some useful context for understanding the challenges of her writing when Williams talks about how she is engaged in producing what she calls the ‘collapsed lyric’: ‘You could think of [the “collapsed lyric”] as the expanding and collapsing bellows of an accordion, which sometimes produces a cacophony of dissonance and competing notes, and often only the insistence of one solitary tone.’ In other words, it seems that Williams is aiming both for a certain tonal simplicity as well as the confusions of ‘cacophony’ and ‘dissonance’. A fascinating challenge. I’m currently in the middle of writing an essay about Williams’s work – which will hopefully form the basis for a Devolved Voices lecture later in the year. (Watch this space!) And it’s this notion of the ‘collapsed lyric’ that is directing my thinking. The middle part of the Devolved Voices project has been all about building up the bulk of our materials and analysis. Most obviously, perhaps, Kathryn Gray has been adding wonderful material to the library of poets who have been interviewed for the project’s online media section. So do look out for fascinating upcoming videos of Zoë Brigley, Patrick McGuinness, and Philip Gross. These pieces struck me as having, between them, real intellectual bite, as well as moments that were rather moving. Of course, each interview also has a companion video of the poet in question reading from his or her work, so it’s three such ‘doubles’ that are on their way soon. Over the same time, I have been trying to carve out a series of lectures about a range of poets who have established themselves since 1997. Choosing which poets to write about has been something of a challenge – there are many you could make a strong case for looking at. The basic idea here (to which I’m committed by the project’s original proposal) is that I should produce detailed studies of eight writers who I think have some sort of significance – by which I suppose I mean that I think their work is valuable in some way (although perhaps I just enjoy it myself! ), or that it has gained a certain cultural currency. These studies are intended to be delivered as lectures in the first instance, with each of them subsequently being turned into an individual chapter in a book that will bring them all together. These three temporal categories give me six of my eight poets. However, to complete my eight, I realised that I wanted to look at two poets who are strongly situated within what might be called a neo-modernist or neo-avant-garde tradition. John Goodby has argued for the importance of modernism to the work of Welsh poetry in English since the 1930s (see note below). And as John and I clearly share a sense of issues and material that need to be explored here – some years back, I wrote the beginnings of an attempt to unearth a ‘radical’ Anglophone Welsh poetics since the 1960s – I wanted my current series of lectures to have a dedicated space for poets who I see as working self-consciously within this particular literary context. The lectures and essays that will (I trust!) be the upshot of all this are not an attempt to provide some sort of overview of post-1997 Welsh poetry in English. But I do hope they’ll constitute an interesting attempt to provide extended readings of poets whose work is, I think, significantly visible – in one way or another – within the field. In his article ‘“Deflected Forces of Currents”: Mapping Welsh Modernist Poetry’, Poetry Wales, 46/1 (summer 2010), pp. 52-8, John Goodby suggests that ‘what makes Anglophone Welsh poetry most distinctive is its pronounced modernist origins’ (p. 52). Indeed, he argues that, for Welsh poetry in English, ‘alternative poetry’ is ‘not so much “parallel” to a mainstream as that mainstream itself’ (p. 58). John Redmond’s recent book from Seren, Poetry and Privacy: Questioning Public Interpretations of Contemporary British and Irish Poetry (2013), puts forward an argument that poetry is all too often read automatically alongside public issues. Poetry is thus, Redmond suggests, contorted to fit one social theme or another. By contrast, what he wants to argue is that if you scratch at such public interpretations of poems, they tend to flake away – with poems often being revealed as much more fundamentally expressions of a private state. The poem, I will argue, is not about history. It is about consciousness. What gives the poem its complexity are the conflicting attitudes towards consciousness which it keeps in play. (p. 40). 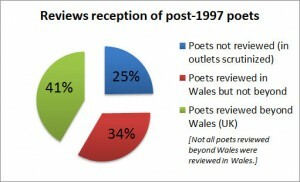 For a project such as ‘Devolved Voices’ which is, precisely, constructed around the public matter of Wales’s post-1997 devolutionary story, we do well to bear in mind Redmond’s caveats about public and private interpretations of poetry. At the simplest level, what his book seems to suggest for our purposes is that writing which emerges from a devolved context does not always have to speak to that context. Or to put that somewhat differently, and to echo issues raised by Jasmine Donahaye in the book Slanderous Tongues, a sort of ludic play in poetry of the early devolutionary period does not necessarily point to a sense of post-devolution confidence. To misappropriate a phrase from Freudian apocrypha, sometimes ludic play is just ludic play. The poem, to put it differently again, does not have to become a figure for, or an allegory of, its socio-cultural context – specifically, in our case, the devolving state of Wales. I understand the nature of Redmond’s objection: don’t assume that, just because a poem was written during particular circumstances, it has to be about those circumstances. Indeed. However, I don’t think Redmond’s second sentence at this point necessarily follows his first: just because one poem seems compellingly to do with its generative circumstances patently does not mean that all poems must be so read. That is a question for the nuances of critical judgement, from case to case. But Redmond’s fundamental point here seems sound to me and really very simple: the most helpful, most revealing way of reading a poem isn’t necessarily through the public issues of its time and place – although I simultaneously want to maintain that every poem is, in complex and over-determined ways, bound (to take Redmond’s word) to its generative socio-cultural context in the same way as it is bound to the generative psychological context of its author. Notwithstanding such caveats, Redmond’s warnings against deterministic or simplistic ways of reading that box poetry into ready social categories, trends, and events are clearly useful. A project of literary analysis done under the sign of devolution must not contort its poetic subjects so that they all point, in obedient critical fashion, in a neatly devolutionary direction. I’ve been interested by statistics to do with national identities in post-devolution Wales for quite a while, and the recent Welsh Devolution in Perspective conference at the British Academy got me thinking about the issue again. Cardiff University’s Professor Richard Wyn Jones was one of the speakers at the event, and references he made to the 2011 Census made me realise that there were things in the Census data that might well be important for our understanding of national identity in the post-devolution period. And this is an issue that is clearly important for Devolved Voices: the project crucially challenges us to address potential relationships between post-1997 Anglophone Welsh literature and the socio-cultural milieu out of which it emerges. What RWJ said, then, was that the results of the 2011 Census question about national identity indicate a weak sense of British identification and a strong sense of Welsh identification in the Welsh population. (These are the results for Question 15 in the ‘Individual questions’ section of the 2011 Census questionnaire: ‘How would you describe your national identity?’) Strange, I thought: if that’s the case, don’t the results about Britishness conflict with existing information about national identity in Wales? As RWJ pointed out to me in a subsequent conversation, the Census hasn’t asked this particular national identity question before. (The row about the lack of a Welsh tick-box in the 2001 Census was, of course, to do with the question in that Census about ethnic identity.) So, in the strictest sense, the 2011 Census results about national identities exist without comparative context. Or to put it slightly differently, the information drawn together by the Census isn’t directly comparable with previous statistical considerations of the same broad issue, as earlier surveys have (for example) been collected along different lines and under different conditions from the Census itself. Admitting this caveat, what Richard Wyn Jones had said at the conference still surprised me. Turning to Martin Johnes’s recent volume Wales Since 1939 (Manchester University Press, 2012), p. 431 very helpfully offers a table of Moreno scale surveys of national identity in Wales from 1992 to 2007 (table 14.3). Just a little data-crunching from the figures in this table suggests that, in recent years, a significant percentage of the population of Wales has had some level of identification with British identity – either alone or in some sort of combination with Welsh identity. To get the amounts of people identifying in some way with Britishness, you need to exclude respondents identifying with the ‘Welsh not British’ label, as well as anyone who does not identify themselves at all with the various Welsh/British options offered by the Moreno scale. If you do this, Britishness plays a part in the various surveys as follows: 71% of respondents in 1992 considered themselves in some way to be British; 80% in 1997; 76% in 1999; 73% in 2001; 73% in 2003; and 72% in 2007. Even if you exclude the weaker British identification suggested by the ‘More Welsh than British’ category of respondents, the figures come out as follows: 51% in 1992; 51% in 1997; 57% in 1999; 50% in 2001; 46% in 2003; and 51% in 2007. Some sense of Britishness, in other words, has apparently been a substantial player in the national self-identification of the Welsh population in recent years. Then we have the 2011 Census. The national identity question allowed respondents to choose multiple identities, although not (and by contrast with the Moreno scale) to indicate their comparative importance. The upshot – according to the separately downloadable chart associated with Figure 4 of the ONS document Ethnicity and National Identity in England and Wales 2011 – was a level of British identification across the Welsh population which was around half as large as the latter set of figures cited above: 26.3%. But what if we consider the data Johnes cites in terms of what it tells us about Welsh identification? Well, in that case, we see the following: 85% of respondents in 1992 identified in some way with Welshness; 78% in 1997; 79% in 1999; 86% in 2001; 85% in 2003; and 84% in 2007. Again, if you remove the weaker element of Welsh identification (the ‘More British than Welsh’ category), you get this: 78% in 1992; 68% in 1997; 72% in 1999; 75% in 2001; 77% in 2003; and 74% in 2007. The Census tells us that 65.9% of respondents self-identified with Welshness (either alone or in combination). In other words, there is far less of a difference between these figures than there is between the corresponding figures for Britishness. Or to put it differently: identification with Welshness seemingly holds up between the two different survey approaches, whilst identification with Britishness does not. Of course, as I said above, detailed or direct comparisons are difficult to draw between the Moreno scale data that Johnes’s book gives us and the rather different form of the data obtained by the Census. Nonetheless, the detailed breakdown of 2011 Census data provided in the ONS data sheet 2011 Census: National identity (detailed), local authorities in England and Wales (document QS214EW) does give some pause for thought. From this more detailed Census data, then, we discover that British-only identifiers in the Welsh population come in at 16.9% – interestingly not much below the 19.2% for England. Moreover, that 16.9% also broadly resonates with at least some of the figures that Johnes cites for the proportion of ‘British not Welsh’ identifiers since 1992: 14% in 1992; 15% in 1997; 14% in 1999; 11% in 2001; 9% in 2003; and 10% in 2007. Turning to Welsh-only identifiers in the Census, we find that this cohort comes in at an average of 57.5% across the country as a whole – with the highest percentage figure being found in Rhondda Cynon Taf (73.3%). By contrast, the ‘Welsh not British’ cohorts in Johnes’s table never reach past 28% (in 1992). (In the years of the devolution ‘yes’ vote in 1997 and the establishment of the WAG in 1999, the figures for ‘Welsh not British’ identification were 13% and 17% respectively; the most recent figure cited by Johnes, 2007, was 22%.) Even taking into account that the Census data set is structurally different from the sets cited in Johnes’s book, the broad suggestion of difference here is striking. It is, however, in the combination of British and Welsh identity that such a ‘broad suggestion of difference’ is perhaps most startling. Even if we only consider the ‘Equally British and Welsh’ cohort of the data sets given in Johnes’s book (i.e. if we exclude the ‘More Welsh than British’ and ‘More British than Welsh’ categories from a combined British and Welsh identification), the percentage of such identifiers is as follows: 30% in 1992; 26% in 1997; 36% in 1999; 28% in 2001; 29% in 2003; and 31% in 2007. Indeed, in all the sample years except 1997, ‘Equally British and Welsh’ was the plurality category of national self-identity. In the Census, however, respondents who identified themselves as both British and Welsh (with no other identifiers chosen alongside those two) came in at just 7.1% across the whole of Wales – a figure that is, it should be noted, less than English-only identifiers, whom the Census indicates as accounting for 11.2% of the population of Wales. As merely an interested observer rather than a trained political scientist, I’m cautious about trying to draw anything like precise conclusions from two clearly different sorts of data. Indeed, I would be very pleased to hear from any experts about what implications the differences in data collection and question construction might have for the sets of data themselves – and for how they might be read against one another. However, I find it hard get away from the fact that there are apparently some very substantial differences between the broad suggestions about national identity in the surveys cited in Johnes’s book – surveys, of course, going back a number of years – and the results of the 2011 Census. The large size of the cohort in the Census that self-identifies as Welsh-only is one striking thing; the small percentage of those who identify as both British and Welsh is a second; and the modest level of British self-identification as a whole is a third. Then there is what I suggested above: that identification with Welshness seemingly holds up across the Moreno scale surveys and the Census; levels of identification with Britishness, however, do not. It would, I think, be somewhat naïve to draw those final observations to the defence of a position that sought to argue, in a very straightforward manner, that Wales-associated literary production is now taking place in the context of some sort of newly dominant Welsh identification on the part of the population of Wales. However, I’m tempted to speculate that there may be something here about the apparent resilience of Welsh identity – in other words, that self-association with Welsh identity in the Welsh population is something that does not seemingly disintegrate in the change from one sort of survey to another. Might any political scientists care to comment? Because if this is the case – this notion of the resilience of Welsh identification – then it’s an issue that certainly demands some thought in the context of a project that requires attention to the socio-political contexts out of which poetry emerges. 1. The 2001 ‘Wales Household Form’ is available to download from http://www.ons.gov.uk/ons/guide-method/census/census-2001/about-census-2001/census-2001-forms/index.html. Question 8 in the sections for each individual ‘Person’ in the household is about ethnic identity; there is no question about national identity. For a brief explanation of the rationale behind the new question on national identity in the 2011 Census, see the ONS document Ethnicity and National Identity in England and Wales 2011, p. 10. 2. The Moreno scale asks respondents to place themselves in one of the following categories: ‘Welsh not British’, ‘More Welsh than British’, ‘Equally Welsh and British’, ‘More British than Welsh’, ‘British not Welsh’, ‘None of these’. 3. These figures draw together the following cohorts: ‘More Welsh than British’, ‘Equally Welsh and British’, ‘More British than Welsh’, and ‘British not Welsh’. 4. These figures draw together the following cohorts: ‘Welsh not British’, ‘More Welsh than British’, ‘Equally Welsh and British’, and ‘More British than Welsh’. 5. As in the previous paragraph, this figure is drawn from the separately downloadable chart associated with Figure 4 of the ONS document Ethnicity and National Identity in England and Wales 2011. This is a brief edited extract from a research paper that Matthew Jarvis gave to the Department of English & Creative Writing at Aberystwyth University on 24 October 2012. The passage presented here is part of his discussion about the decision to start the timeframe of the Devolved Voices project from 1997 (the year of Wales’s devolution ‘yes’ vote) rather than 1999 (‘the date of the actual creation of the National Assembly for Wales, following the first Assembly elections on May 6th of that latter year’, as he put it earlier in his presentation). Whilst it is demonstrably false to look at 1999 as constituting some sort of clear-cut starting-point for devolved existence, it is nonetheless the case that the 1997 vote to create the National Assembly for Wales ushered in something very new indeed. Writing in the volume The Challenge to Westminster: Sovereignty, Devolution and Independence, the historian Keith Robbins suggests that, in the period 1536–43, Wales was essentially incorporated into the English state ‘before Wales had achieved what we might call the scaffolding of statehood’. As such, the striking opening contention of Robbins’s essay is, quite simply, that ‘The assembly […] which has now been set up in Cardiff cannot be meaningfully said to have had a predecessor’. Effectively – and pertinently by comparison with Scotland, for example – Robbins is suggesting that the practical machinery of statehood is historically absent from Wales. Welsh nationalism, lacking an institutional focus, had to build on less concrete factors – language, religion, and culture. It was left to writers, poets, and preachers to create ‘the cultural form, the tracery of a nation where no state had existed’. Now I must be clear about what I’m getting at here: Bogdanor’s analysis at this point isn’t claiming that no Welsh nation has existed, but rather that no Welsh state has existed – and, in this respect, he is building on the distinction between what he describes as ‘a nation which had succeeded in retaining the institutions of statehood and one which had not’. In Marxist terms, perhaps somewhat unfortunately, this is the distinction between what are termed ‘historic’ as opposed to ‘non-historic’ nations. Wales, for Bognador, then, belongs to the latter category, along with (to cite his two parallel examples) ‘the Corsicans and the Bretons’. For the ‘Devolved Voices’ project, then, 1997 is the starting-point because – and exactly because –that is the point at which Wales commits itself to having precisely such ‘institutions of statehood’, at least to the extent that they were embodied in the initial Assembly. The ‘yes’ vote itself is a fundamental declaration of intent, which seemingly makes a profound impact on the sensibility of the nation. As Richard Wyn Jones and Roger Scully indicate in their fascinating study of the 2011 referendum, opposition to an elected body in Wales dropped sharply from 37% to 24% between 1997 and 1999 – only going down a further 7 points in the subsequent decade. In parallel, support for a parliament shot up 10 points in those same two years. A striking change in sensibility, in other words, appears to have taken place in the post-vote, pre-Assembly period of 1997–99. Given such observations, there’s no way – for our purposes as a project – that we could start from 1999, rather than 1997, in terms of thinking about poets who emerge within the devolutionary flux of the late 1990s. Yet very carefully, and with considerable reluctance, Wales is remaking itself. What changes this morning, imperceptibly but permanently, is a sense of a people’s esteem for itself. With that must come tolerance – indeed, celebration – of the differences of others. Writers here should savour such things. And then be wary. Why ‘wary’? Well, Minhinnick goes on to urge that, whatever the result of the referendum had been, there would be no future in what he calls ‘the dour, regional introspection that underlies much art in this country’. Rather, on the back of what he sees as the new potential for post-vote self-esteem, he urges Wales’s writers to ‘look at the wider world, read about it, and visit it. […] Then come back and for all our sakes share what has been discovered’. In short, for Minhinnick, the new post-vote confidence should free our creative powers from naval-gazing and turn us outwards to the world. Keith Robbins, ‘Cultural Independence and Political Devolution in Wales’, in H. T. Dickinson and Michael Lynch, eds, The Challenge to Westminster: Sovereignty, Devolution and Independence (East Linton: Tuckwell, 2000), pp. 81–90: p. 82. Ibid., p. 81; emphasis added. Vernon Bogdanor, Devolution in the United Kingdom (Oxford: Oxford University Press, 1999), p. 144. Bogdanor’s quotation here is from key New Left thinker Tom Nairn, who was writing in Planet in 1976. Richard Wyn Jones and Roger Scully, Wales Says Yes: Devolution and the 2011 Welsh Referendum (Cardiff: University of Wales Press, 2012), p. 68. Robert Minhinnick, ‘A Country That Said Yes’, Poetry Wales, 33/2 (October 1997), p. 2.